Cooperative Extension will be most relevant in policy circles if it embraces both its technical and relationship-based strengths. Based on research-to-policy narratives provided by UC Cooperative Extension (UCCE) academics, we argue that current, effective Cooperative Extension (Extension) practices support a broader, more convincing account of Extension's public value than its leaders often articulate. This proposed account incorporates the familiar Extension narrative in which technical expertise and objectivity are emphasized. It also incorporates the insight, derived from our data, that Extension can achieve its greatest relevance in policy circles when it weaves together its ability to provide trustworthy technical knowledge with its capacity to influence policy dialogue, debate and practice across multiple settings and over the long term. In a policy world often marked by short-term thinking and polarization, Extension's ability to foster deliberative, context-sensitive and future-oriented policymaking is a critical contribution to society. Interview data reveals three approaches to effective policy-oriented relationship building: community-government partnership building; stakeholder-oriented experimental research; and community empowerment. Understanding these approaches can help reframe the story that we in the Extension system tell ourselves and the public about the public value we create. UC Nutrition Policy Institute research has helped guide state and national policies that improve child and family health. Vegetable and fruit consumption plays an important role in lowering the risk of obesity, heart disease, diabetes, stroke and some cancers. Yet, only 20% of the population eats the daily recommended amount of produce, and 10% of children do not consume any vegetables or fruit on a daily basis. To increase vegetable and fruit intake across the population, which can extend lives and reduce health care expenditures while also enhancing demand for California agricultural products, the UC Nutrition Policy Institute has conducted research to guide public policy and institutional and community programs. The institute has studied produce consumption among children and families in child care settings, emergency food systems, schools and federal nutrition assistance programs. Conducting research to support policymakers in deciding on effective nutrition programs and policies involves partnering with community organizations and decision-makers from the outset, collecting qualitative as well as quantitative data, and sharing research findings with those who can act upon them. For more than 30 years, UC has tackled the obstacles that inhibit widespread landscape water conservation, with new science, trainings and contributions to state policy. UC has been heavily involved in research and extension efforts impacting landscape water conservation legislation for over 30 years. In 1981, UC implemented the California Irrigation Management Information System, a network of weather stations that provides data for local estimates of plant water needs. Those estimates led to UC being able to advise the California Legislature on policies for maximum applied water allowances for residential and large landscaping projects. The allowances have been reduced significantly with UC guidance, and UC has helped landscapers to meet the increasingly restrictive requirements. Best practices that reduce water losses have been developed in collaboration with equipment manufacturers and landscaping specialists, and explained to end users. In addition, UC has developed the WUCOLS database, which classifies over 3,500 plants by their water needs. UC's involvement in landscape water conservation continues on many fronts, developing science and contributing to policy. The models have been used to assess patterns of stream flow modification, inform California's Cannabis Cultivation Policy and highlight shortcomings in the state's water accounting. Management of California's vast water distribution network, involving hundreds of dams and diversions from rivers and streams, provides water to 40 million people and supports a globally prominent agricultural sector, but it has come at a price to local freshwater ecosystems. An essential first step in developing policies that effectively balance human and ecosystem needs is understanding natural stream flow patterns and the role stream flow plays in supporting ecosystem health. We have developed a machine-learning modeling technique that predicts natural stream flows in California's rivers and streams. The technique has been used to assess patterns of stream flow modification, evaluate statewide water rights allocations and establish environmental flow thresholds below which water diversions are prohibited. Our work has informed the statewide Cannabis Cultivation Policy and influenced decision-making in more subtle ways, such as by highlighting shortcomings in the state's water accounting system and building support for needed reforms. Tools and techniques that make use of long-term environmental monitoring data and modern computing power — such as the models described here — can help inform policies seeking to protect the environment while satisfying the demands of California's growing population. More than 94% of dairy producers were in compliance with new regulations to protect water quality after a carefully staged, collaborative plan to support the transition to new practices. For 50 years, UC Agriculture and Natural Resources (UC ANR) has contributed to dairy water quality policy in California and helped, with partner organizations, to implement it in the dairy industry. When conditional waivers for waste discharge requirements expired in 2003, UC ANR shared research and best professional practices as regional water quality control boards developed new orders. UC ANR academics then worked with water quality control boards' staff and dairy industry representatives to develop feasible, staged implementation plans. Collaboratively, more than 50 hours of workshop curriculum were developed and disseminated, helping dairy producers to accept scientifically sound management practices that are more protective of groundwater. Research by UC ANR to better understand system dynamics, nitrogen management and practices to minimize the impact of manure application on groundwater quality continues, as does a program in environmental stewardship. 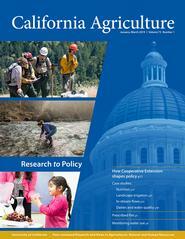 UC ANR works to bridge the gap between scientists and policymakers. In recent decades, California has made sparing use of fire as a land management tool. But policy changes, partnerships and attitude shifts are creating conditions for expanded use of prescribed fire. For ranchers and farmers in remote locations, monitoring water diversions can present special challenges — that a new course helps overcome. The collaboration helps to coordinate research on the extent and nature of tree mortality and gets the results to forest managers quickly. Growers, regulators and native plant restoration experts are together trying to reduce the spread of more than 25 new Phytophthora taxa. The primary technical publication of UC Agriculture and Natural Resources for 70 years is accessible online.